Click image to zoom in. Or view larger version. Untitled. 1906. Photographer unknown. Gelatin silver print. Collection of Oakland Museum of California. 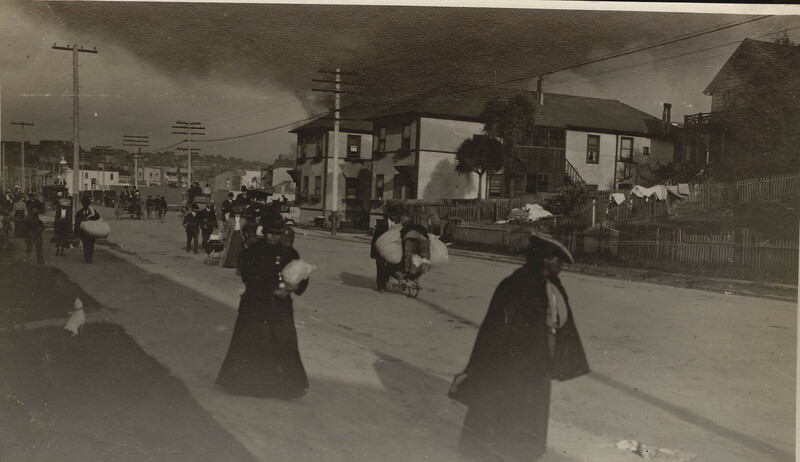 This photograph shows refugees migrating to the Presidio after the 1906 San Francisco earthquake. Approximately 325,000 people were left without a home after the earthquake. It is estimated that 75,000 citizens left San Francisco, with the remaining 250,000 establishing temporary homes within 26 official refugee camps.